This entry was posted in Marketing, Uncategorized, Updates, Writing and tagged ABNA, Amazon Breakthrough Novel Award, BookBub, Publisher's Weekly, publishing contract, quarter-finalist, semi-finalist by Sandra Hutchison. Bookmark the permalink. Congratulations on your novel being a semi-finalist! Thanks, Sarah. Hope you’re doing all right! First off, Sandra…Sincere and hearty congratulations on being a semi-finalist! That is no small feat, and you should be very proud of yourself. If you’re not, then I’m proud for you. Thanks, as well, for sharing your experiences and observations with us. I have no doubt that your sales will pick up again and that you’ll enjoy the same success you did before the contest. Fans will be eagerly awaiting your next book! Sandra, this was a great post. Congrats on making the semi-finals. I only made it as far at the quarterfinals. But I enjoyed the process and would do it again. Thanks, Mike. Were you active socially with the other authors? Did you use it to promote? (I’m wondering what would make it more enjoyable and/or profitable.) Right now it’s striking me as only useful if I really want to gain that final contract with Amazon. I doubt Amazon really guides who gets there overly much. I am self published and managed the semi-finalist list for mystery thriller, but I’ve sold all of about 20 copies of the book entered (well, more now, but it was low)–I have been serially releasing, so that may be my problem, but my sales have been baddish and my reviews have been GOOD, but are with the separate pieces (the serial thing…) so there were none on my ABNA entered book. My other friend I know a little better who made the list hadn’t published at all–I think you made it real deal normal route. I should probably write a more detailed post. I informed my readers I was out, but I haven’t done the analysis. That may well be the case, Hart. It may also be that they mix it up on purpose. I became more skeptical about all contests after working one for a photographer once. EVERYBODY won the free 5 x 7 — because, of course, it was a way to try to upsell a whole new set of clients (as, indeed, CreateSpace gets to do with anyone who enters). No sweepstakes or contests are ever run without a profit or at least a publicity motive. 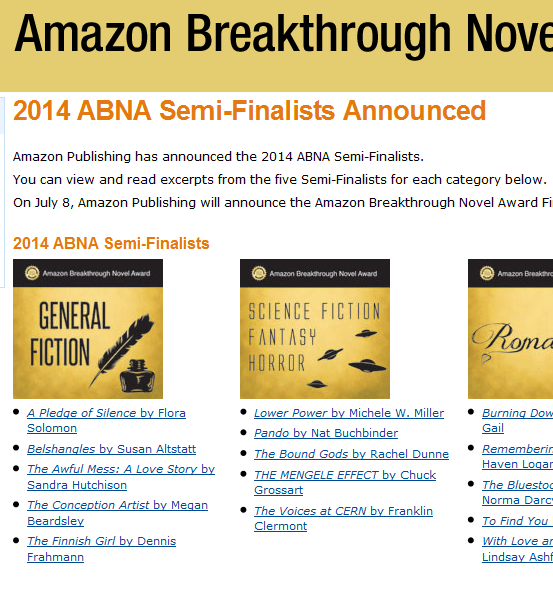 For the publishing division of Amazon I would think there has to be some consideration of who will prove to be the most profitable (and least obnoxious) authors to work with over the long haul, and the way ABNA is structured would seem to allow quite a bit of maneuvering on their part to help them achieve that. I don’t think there’s anything nefarious about it, nor do I think it means sales were the only metric and quality was ignored. I’m sure all the quarter- and semi-finalist entries had something to offer. Oh, thanks, Annie! I hadn’t seen this before.